Darlinghurst is a densely populated suburb with the majority of residents living in apartments or terraced houses. Once a slum and red-light district, Darlinghurst has undergone urban renewal since the 1980s to become a cosmopolitan area composed of many unique precincts. Places such as Victoria Street (which connects Darlinghurst to Potts Point in the north), Stanley Street (Little Italy) and Crown Street (Vintage and Retro Fashion) are known as culturally rich destinations. These high street areas are connected by a network of lane-ways and street corners replete with small bars, cafes and boutique indie retail. Demographically, Darlinghurst is home to the highest percentage of generation X and Y (28–47 years of age) in Australia. The vast majority of businesses in Darlinghurst are independently owned and operated small businesses with over 50% of all commercial activity in the area being consumer oriented: indie retail, food, drink, dining, leisure and personal services. Darlinghurst is also home to large number of off-street creative industries. This business mix coupled with the area's history of inclusion and acceptance give Darlinghurst an eclectic and vibrant flair. Darlinghurst's main street is Oxford Street. This major Sydney road runs east from the south-eastern corner of Hyde Park through Darlinghurst and Paddington and terminates at Bondi Junction. Oxford Street is one of Sydney's most famous shopping and dining strips. The Darlinghurst end is well-known around the world as the centre of Sydney's gay community, is the yearly parade route of the Sydney Mardi Gras and the spiritual birthplace of the LGBT rights movement. It is home to a number of prominent gay venues and businesses, while more broadly Darlinghurst is a centre of Sydney's burgeoning small bar scene. From the 1990s onwards Oxford Street began to garner a reputation for being Sydney's primary "nightclub strip", popular with both gay and straight clubbers, surpassing the notorious red-light district of Kings Cross in popularity. As a result of the influx of revellers, crime rates reportedly increased in the area around 2007, particularly for assaults and robberies. This reported increase should be understood in terms of a very low background crime rate in East Sydney in general. There are a number of named localities in and around Darlinghurst including Taylor Square, Three Saints Square, Kings Cross and confusingly also East Sydney. Locals have used this name to refer to the area immediately around Stanley Street in the suburb's west, however the title is used more broadly throughout the area from Wooloomooloo up to Taylor Square where the old Darlinghurst Gaol still has the words East Sydney in brass lettering above the main entrance. This is because from 1900 to 1969 the entire area to the east of Sydney's CBD, from the harbour to Redfern, was an electorate known as the Division of East Sydney. Already in 1820 the entire ridge line running from Potts Point to Surry Hills was known as Eastern Hill. 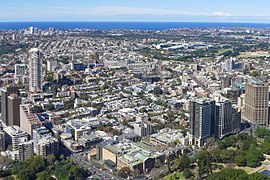 Darlinghurst shares a postcode (2010) and an extensive soft southern border with neighbouring suburb Surry Hills which, with Paddington to the east and Woolloomooloo, Rushcutters Bay and Potts Point to the north, comprise the metropolitan region of East Sydney. Although only minutes walk away from the Sydney CBD, this region is geographically distinct from it; separated from the more well known commercial centre by several landmarks: Central railway station, Hyde Park, St Mary's Cathedral and The Domain. East Sydney hosts numerous restaurants that consistently garner local and international media attention. Sydney's Eastern Suburbs cover all the land from the east of Darlinghurst up to the Pacific Ocean. The suburb was originally known as Eastern Hill and then Henrietta Town, after Governor Lachlan Macquarie's wife, whose second name was Henrietta. 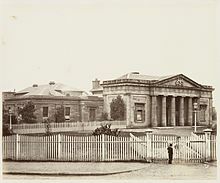 The loyalties changed with the change of governors and the suburb became Darlinghurst in honour of Elizabeth Darling, the popular wife of Governor Ralph Darling, during the early 19th century. The suffix 'hurst' is derived from the Old English word hyrst, meaning wooded area. 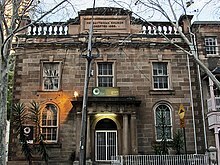 Darlinghurst has two of Sydney's museums: the Australian Museum (a natural history museum) and the Sydney Jewish Museum. The suburb also features St Vincent's Hospital, and is associated with the Sacred Heart Hospice on Darlinghurst Road, and the Garvan Institute of Medical Research. Darlinghurst Gaol, the large sandstone penal complex in the middle of Darlinghurst was built between 1836 and 1840. The large sandstone walls still bear convict markings, and the complex features six wings surrounding a circular chapel. Australian poet Henry Lawson spent time incarcerated here during some of the turbulent years of his life. The last hanging at the gaol was in 1907 (Jahn, 1997). 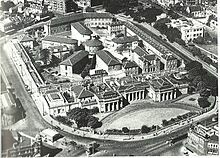 The site became East Sydney Technical College in 1921, but was turned into the National Art School from 1995. Darlinghurst Fire Station was completed in 1912, this three-storey brick and stone building occupies a prominent location at the corner of Darlinghurst Road and Victoria Street. It was designed in 1910 by Walter Liberty Vernon (Jahn, 1997). It still functions as a fire station and is listed on the Register of the National Estate. Darlinghurst Courthouse is an imposing heritage-listed sandstone building on Taylor Square. It was designed by architect Mortimer Lewis in 1844, and has a Greek Revival style facade. The central block is adapted from an 1823 design in Peter Nicholson's The New Practical Builder (Apperly, Irving & Reynolds, 1989). Oxford Street is the major commercial thoroughfare of Darlinghurst, running from the south-east corner of Hyde Park, through Taylor Square and beyond into Paddington, Woollahra and Bondi Junction, respectively. Oxford Street was originally called The South Head Road and work commenced on the road in 1811 (Faro, 2000). It was a toll road in its early years with the toll gates being located near present-day Glenmore Road. Oxford Street assumed its current name in 1875. Oxford Square is located at the intersection of Oxford and Burton Streets. Oxford Square is also the name of a small shopping centre located opposite, on the corner of Oxford and Riley Streets. Stanley Street is one of the suburb's two secondary restaurant strips (with Victoria Street) and is often referred to as Sydney's first "Little Italy". However, the restaurants range from Japanese, Thai and Italian and the prices range from basic to moderate. There is an annual Italian Festival held here every June. Victoria Street is the other major cafe strip. Restaurants range from basic to upmarket. The majority of the cafes have outdoor seating. Several iconic restaurants are in this area, such as Tropicana and Bar Coluzzi. The Horizon apartments consist of a residential tower and two lower buildings of apartments, 6 levels of car parks, swimming pool, a tennis court, gym and surrounding gardens. Darlinghurst Presbyterian Church, erected in 1850. Of occupied private dwellings in Darlinghurst, 77.0% were flats or apartments and 21.1% were semi-detached, row or terrace houses, townhouses etc., . Just 0.5% of dwellings were separate houses, compared to the national average of 72.9%. Darlinghurst's commercial activity is centred on Oxford Street, and extends to Victoria Street, Flinders Street, Crown Street, Cleveland Street, and Darlinghurst Road. There are a large number of cafés, restaurants and take-away food stores throughout Darlinghurst, as well as a large number of pubs and nightclubs, many of which are on Oxford Street. These pubs and clubs are now subject to controversial 'lock-out' laws imposed by the Liberal state government in February 2014, in which venues must stop admitting new customers after 01:30, and cease the service of alcohol between 03:00 and 05:00. These laws were introduced as a response to violence in the Inner City of Sydney that was related to alcohol intoxication. There is also a significant retail presence, including fashion retailers. Darlinghurst is well-served by public transport, with many bus routes from the Eastern Suburbs converging on Oxford Street prior to entering the central business district. The 380 bus between Circular Quay and Bondi Beach travels through Darlinghurst along Oxford Street. The 333 bus runs the same route but is an express service, only servicing major stops and all passengers must have prepaid tickets. The 378 bus between Railway Square and Bronte also travels through Darlinghurst along Oxford Street. The 392, 394, 396 and 399 buses also travel through the suburb on Oxford Street. Buses that travel through the centre of Darlinghurst are the 311 and the 389 buses. There are no train stations in Darlinghurst, however Kings Cross railway station on the Sydney Trains Eastern Suburbs and Illawarra line is just over the northern border of the suburb. Museum station on the City Circle, is located just to the west of Darlinghurst, on the south-west corner of Hyde Park. Darlinghurst Public School, located on Womerah Avenue, was opened in 1884. Sydney Grammar School is located on College Street, across the road from Hyde Park. This school is a boys-only private school which opened in 1857. The Sydney Church of England Girls' Grammar School (now called SCEGGS Darlinghurst) was founded in 1895 in Victoria Street, Darlinghurst. It moved to its current site in Forbes Street, in 1901. The former Marist Brothers High School at 280–296 Liverpool Street is now an apartment complex named Alexandra. The school occupied this site from 1911 until 1968 when it moved to Marist College Canberra. The National Art School of Australia, a specialist Art school in collaboration with Sydney TAFE, dates back to 1859. The University of Notre Dame's School of Medicine and the School of Nursing are located in the historic parish buildings associated with the Sacred Heart Parish in Darlinghurst. The complex includes state of the art facilities for use by medical and nursing students such as simulated wards, practise wet laboratories and clinical skills laboratories in addition to simulated consulting rooms. St John's, an Anglican congregation. St John's operates Rough Edges, a street outreach centre that functions as a cafe and drop-in centre. It provides a range of services to the local community, including the homeless. Sacred Heart Catholic Church is on the corner of Darlinghurst Road and Oxford Street. There is also a variety of smaller chapels and religious services attached to St Vincent's Hospital and other religious organisations in the suburb. The building which previously housed the Church of Christ, Scientist is now a private residence. There is also the defunct St. Peter's Anglican church, Bourke Street, which is now part of SCEGGS Darlinghurst. The area has often been a battleground between the two councils of the City of Sydney and the City of South Sydney. Most of the suburb belonged to South Sydney, however the New South Wales State Government moved the borders repeatedly in order to change the make-up of the City of Sydney. Many claim that these shifts have been attempted to shift the balance of power in the favour of the party in control of the State Government, though some residents of Darlinghurst and Potts Point (the former North Ward of the City of South Sydney) felt that the postcodes of 2010 (Darlinghurst and Surry Hills) and 2011 (Elizabeth Bay, Kings Cross, Rushcutters Bay, Woolloomooloo and Potts Point) were relatively neglected by the City of South Sydney. However, this battle is now moot since both councils were forced by the State Government to amalgamate in February 2004. An election was held on Saturday, 27 March 2004, in order to elect a new council for the redesignated (expanded) City of Sydney. Critics of the amalgamation have claimed that the election demonstrated strong voter backlash against the State Government for pressing the issue. The Australian Labor Party, for whom the area was usually safe, had their primary vote reduced to approximately 20%. The independent Clover Moore took the Lord Mayoral position, having campaigned against the Government's dismissal of the Council. 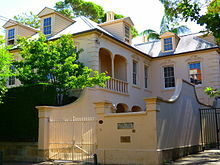 At a federal level, Darlinghurst falls in the electorates of the Division of Sydney and Wentworth. Its current parliamentary representatives are Tanya Plibersek (Labor) and Kerryn Phelps (Independent). These electorates have some of the state's strongest support for The Greens. The following buildings are listed on the Register of the National Estate or the State Heritage Register. The Darlinghurst area is famous for the annual Sydney Gay and Lesbian Mardi Gras. The parade, first held in 1978 as a protest march by members of the gay and lesbian community, marks the end of a three-week festival and takes place on Oxford Street, the main street that runs through several suburbs, including Darlinghurst. 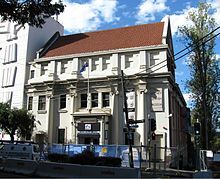 The Sydney Jewish Museum is on the corner of Darlinghurst Road and Burton Street (148 Darlinghurst Rd) and features exhibitions about the Jewish community in Sydney. There are many small private art galleries in Darlinghurst, including Black Eye Gallery (Darlinghurst Road; photography), King Street Gallery on William (William Street; painting), Conny Dietzschold Gallery (Crown Street; contemporary art), Stanley Street Gallery(Stanley Street; contemporary art), Robin Gibon (Liverpool Street; painting, sculpture), Watters Gallery (Riley Street; painting, sculpture), Gallery 9 (Darley Street; contemporary art) and Liverpool Street Gallery (Liverpool Street; contemporary art). Entry to these galleries is free, and most of the exhibitions will display the work of Australian artists. There is also a gallery in the National Art School (NAS) that hosts exhibitions in a mid-19th century sandstone building. 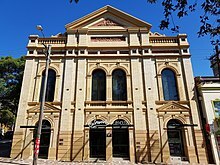 The Eternity Playhouse in Burton Street Darlinghurst opened in 2013, following the renovation of the former Burton Street Tabernacle, which was founded in 1887. Following its purchase by the City of Sydney in 2004, plans were gradually developed to renovate the building as a theatre. The 200-seat theatre is the home of the Darlinghurst Theatre Company, and the renovation was designed by architecture firm Tonkin Zulaikha Greer. George Edward Ardill (1889-1964) - evangelist and social worker. Flora Sydney Eldershaw (1897- 1956) - author and critic. Cecil Patrick Healy (1881-1918) - swimmer and commercial traveller. ^ a b c Australian Bureau of Statistics (27 June 2017). "Darlinghurst (State Suburb)". 2016 Census QuickStats. Retrieved 2 July 2017. ^ "2012 FES overview and summary reports - City of Sydney". www.cityofsydney.nsw.gov.au. Retrieved 10 April 2018. ^ "Oxford Street - City of Sydney". www.cityofsydney.nsw.gov.au. Retrieved 10 April 2018. ^ "Gay and Lesbian Mardi Gras - The Dictionary of Sydney". dictionaryofsydney.org. Retrieved 10 April 2018. ^ "Welcome to Time Out". timeout.com. Retrieved 10 April 2018. ^ Aston, Heath (3 December 2007). "Oxford Street beset with violence". The Telegraph. Retrieved 3 April 2013. ^ "A place for saints and sinners - National - smh.com.au". www.smh.com.au. Retrieved 10 April 2018. ^ "the-east-sydney". the-east-sydney. Retrieved 10 April 2018. ^ "East Sydney Doctors". www.eastsydneydoctors.com.au. Retrieved 10 April 2018. ^ "Darlinghurst - The Dictionary of Sydney". dictionaryofsydney.org. Retrieved 10 April 2018. ^ "2007 Winners - Entertainment - smh.com.au". www.smh.com.au. Retrieved 10 April 2018. ^ "Sydney named top nosh city - World - smh.com.au". www.smh.com.au. Retrieved 10 April 2018. ^ "St. Peter's Church and Precinct". New South Wales State Heritage Register. Office of Environment and Heritage. H00148. Retrieved 18 May 2018. ^ "Wesleyan Chapel". New South Wales State Heritage Register. Office of Environment and Heritage. H00457. Retrieved 18 May 2018. ^ "Bourke Street Congregational Church & School (Former)". New South Wales State Heritage Register. Office of Environment and Heritage. H00382. Retrieved 18 May 2018. ^ "Stoneleigh". New South Wales State Heritage Register. Office of Environment and Heritage. H00187. Retrieved 18 May 2018. ^ "Iona". New South Wales State Heritage Register. Office of Environment and Heritage. H00176. Retrieved 18 May 2018. ^ "St. John's Anglican Church & Rectory". New South Wales State Heritage Register. Office of Environment and Heritage. H00461. Retrieved 18 May 2018. ^ "GA Zink & Sons Building". New South Wales State Heritage Register. Office of Environment and Heritage. H00658. Retrieved 18 May 2018. ^ "Darlinghurst Court House and Residence". New South Wales State Heritage Register. Office of Environment and Heritage. H00792. Retrieved 18 May 2018. ^ "Taylor Square Substation No.6 & Underground Public Conveniences". New South Wales State Heritage Register. Office of Environment and Heritage. H01700. Retrieved 18 May 2018. ^ My Darling Darlinghurst Retrieved 11 October 2017. ^ Marist Brothers Darlinghurst History Retrieved 11 October 2017. ^ Radi, Heather (1979). "Australian Dictionary of Biography". Ardill, George Edward (1889–1964). Australian Dictionary of Biography. Retrieved 30 March 2015. ^ Dever, Maryanne (1996). "Australia Dictionary of Biography". Eldershaw, Flora Sydney (1897–1956). Australian Dictionary of Biography. Retrieved 30 March 2015. ^ Walsh, G.P (1983). "Australian Dictionary of Biography". Healy, Cecil Patrick (1881–1918). Australian Dictionary of Biography. Retrieved 30 March 2015. Wikimedia Commons has media related to Darlinghurst, New South Wales.